The characteristics of human skin are heavily dependent on the hydration of the tissue – in simple terms, the water content. This also changes its interaction with textiles. Up to now, it has only been possible to determine the interaction between human skin and textiles by means of clinical trials on human subjects. 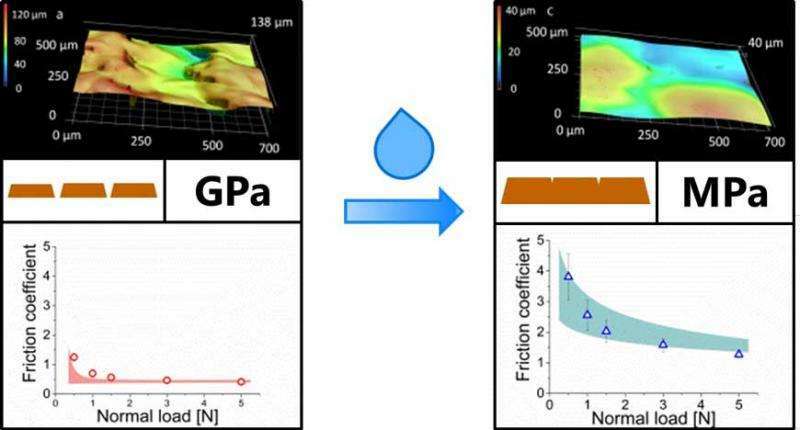 Now, Empa researchers have developed an artificial gelatine-based skin model that simulates human skin almost perfectly. The moisture content of the human skin influences its characteristics. The addition of moisture softens the skin and changes its appearance. This can be seen in DIY work for example: a thin film of perspiration helps to provide better grip when using a hammer or screwdriver; however, excessive perspiration can make the tools slip. The moisture causes the upper layer of the skin (the Stratum corneum) to swell. It becomes softer and smoother and this provides a larger contact area that increases friction. However, too high friction can have a negative effect. The result: blisters on your feet or hands, irritation or rashes. Particularly in connection with textiles that cover our skin, such reactions are frequent and, accordingly, undesirable. In order to test the interaction between skin and textiles, volunteers have been involved and asked to rub their skin against the material to be investigated It was then possible to determine how the skin reacted to it. This can be costly and laborious, sometimes painful and not without a certain degree of risk for the volunteers. Textiles also react differently to the moistness of the skin surface. Slight perspiration when walking, heavy perspiration with endurance sports or running home during a summer downpour: everything has an effect. In future, it will no longer be necessary for volunteers to rub against a t-shirt. 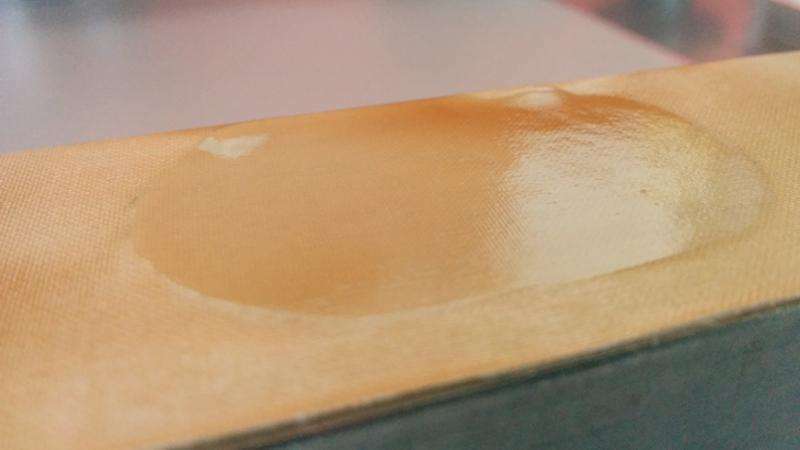 The Empa researcher Agnieszka Dabrowska has developed a skin model that can simulate exactly the characteristics of human skin and can reproduce its frictional behaviour against textiles in dry and hydrated conditions. It will in future be possible to use the model to assist in the development of textiles, as well as other materials that may come into direct contact with human skin. 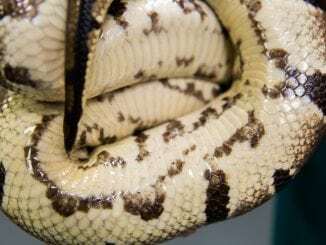 Under these conditions, the model changes its characteristics in exactly the same way as genuine human skin and can thus provide initial insights without exposing humans to the risk of injury or harm. The surface of the skin model also changes in exactly the same way as genuine skin: it swells when it comes into contact with water and thus becomes smoother and softer. Of course, it is still necessary to “put it to the test” with genuine skin in the subsequent development of the textile, but unsuitable textiles can first be rejected at an early stage conveniently, in a risk-free manner and without great expenditure and effort. The basis of the model is standard gelatine, which Agnieszka Dabrowska embeds on a layer of cotton. However, normal gelatine dissolves in contact with water. To prevent this, Dabrowska adds the crosslinking process in which the polymer chains are connected through a chemical reaction. This holds the molecules together and prevents the final skin model from dissolving. “Initially I wanted to work with keratin”, says Dabrowska. Keratin is a water-insoluble fibrous protein in the skin. But the product is extremely expensive. “Gelatine has similar characteristics to keratin, but is much cheaper”, says Dabrowska. “There are also researchers that have carried out preliminary experiments with gummy bears for example”. They also swell when they come into contact with water – exactly like human skin. The model made from gelatine costs only a few Swiss francs, compared with a model made out of keratin, which can quickly run into a few thousand francs. Empa researcher Dabrowska goes one step further however: the model currently depends on external source of water, but this is soon set to change. Her team would like to get the artificial skin to perspire from a few pores in order to bring reality another step nearer.